A Flyboard is a hydroflight system with a board that is secured to the rider’s feet with wakeboard bindings. 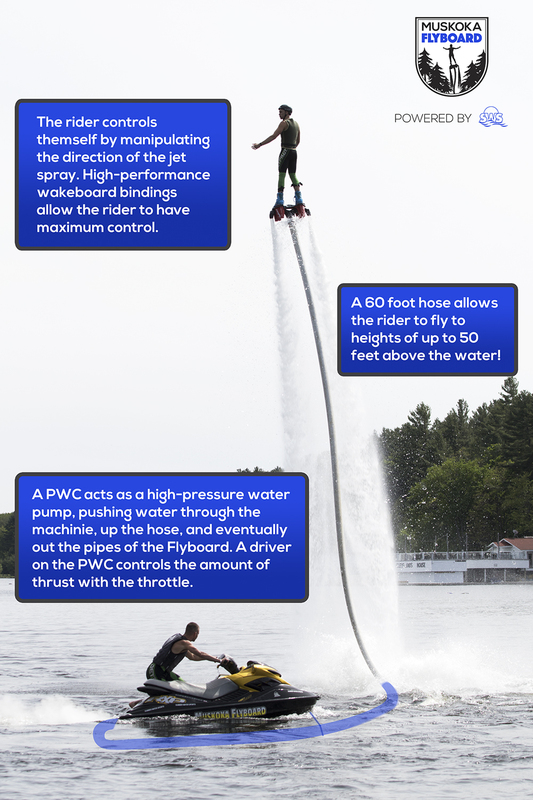 A 60-foot hose extends from the board and bindings to a Personal Water Craft, which pumps water through the hose to the Flyboard, providing enough pressure to propel the rider up to 50 feet into the air. The user controls the navigation of the Flyboard while a driver on the PWC controls the power and height of the flight with the throttle. To maneuver the Flyboard, the user manipulates the spray of the jets by tilting their feet and shifting their body weight. As users become more comfortable and advanced they are able to execute spins, flips, dives, and supermans. That’s when the real fun begins!